If you have a older child - this may be something worth checking out as a gift! Today ONLY - Best Buy is has these NEW! 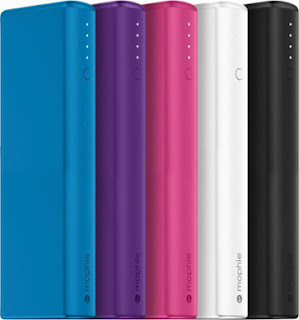 mophie - Power Boost 10,400 mAh Portable Charger for $19.99 (Retail $79.99). Keep your devices charged while traveling with this mophie universal battery. It has a 2.1-amp output that provides enough power to charge a tablet, and an LED battery indicator light lets you know how much juice is left. This mophie universal battery charger is lightweight and compact enough to carry in a purse or backpack.